I am a Lecturer in Computer Science with the Faculty of Engineering and IT in the University of Technology Sydney. My main research interest is to develop behavioural models for human actions online, at the intersection of applied statistics, artificial intelligence and social data science, with an interdisciplinary focus on social influence and information diffusion in online communities. I am also lecturing, see more about my teaching. See my research vision statement for more details. My research revolves around artificial intelligence, machine learning and data mining. More specifically, I am interested in Social Media Analysis, Information Diffusion Models, Popularity Modelling and Prediction. My research project aims to link the dynamics of collective human attention to the individual actions of the users of online platforms. The benefit of my research is to understand novel societal, such as the spread of misinformation and the role of social bots in recent political elections. See more about my research. 2019-04: My interview with Sage Research Methods just got published, in which I discuss using stochastic computational models to study the popularity of online videos. 2019-03: I am doing a one month research visit at the French CNRS laboratory Hubert Curien, where I will be working with Christine Largeron on linking the dynamics online communities and information diffusion processes. 2019-01: I just joined the Faculty of Engineering and IT in the University of Technology Sydney as a Lecturer in Computer Science. M.-A. Rizoiu, T. Graham, R. Zhang, Y. Zhang, R. Ackland and L. Xie, "#DebateNight: The Role and Influence of Socialbots on Twitter During the 1st 2016 U.S. Presidential Debate, " in Proc. International AAAI Conference on Web and Social Media (ICWSM ’18), Stanford, CA, USA, 2018. S. Wu, M.-A. Rizoiu, & L. Xie, "Beyond Views: Measuring and Predicting Engagement in Online Videos, " in Proc. International AAAI Conference on Web and Social Media (ICWSM ’18), Stanford, CA, USA, 2018. S. Mishra, M.-A. Rizoiu, & L. Xie, "Modeling Popularity in Asynchronous Social Media Streams with Recurrent Neural Networks, " in Proc. International AAAI Conference on Web and Social Media (ICWSM ’18), Stanford, CA, USA, 2018. M.-A. Rizoiu, S. Mishra, Q. Kong, M. Carman, and L. Xie, "SIR-Hawkes: Linking Epidemic Models and Hawkes Processes to Model Diffusions in Finite Populations, " in Proc. International Conference on World Wide Web (WWW '18), Lyon, France, 2018. Q. Kong, M.-A. Rizoiu, S. Wu, and L. Xie, "Will This Video Go Viral? Explaining and Predicting the Popularity of Youtube Videos, " in Proc. International Conference on World Wide Web Companion (WWW '18), Lyon, France, 2018. M.-A. Rizoiu and L. Xie, "Online Popularity under Promotion: Viral Potential, Forecasting, and the Economics of Time, " in Proc. International AAAI Conference on Web and Social Media (ICWSM '17), Montréal, Canada, pp. 182–191, 2017. M.-A. Rizoiu, L. Xie, S. Sanner, M. Cebrian, H. Yu, and P. Van Hentenryck, "Expecting to be HIP: Hawkes Intensity Processes for Social Media Popularity, " in Proc. International Conference on World Wide Web (WWW '17), Perth, Australia, pp. 735-744, 2017. S. Mishra, M.-A. Rizoiu, and L. Xie, "Feature Driven and Point Process Approaches for Popularity Prediction, " in Proc. International Conference on Information and Knowledge Management (CIKM ’16), Indianapolis, USA, p. 1069-1078, 2016. M.-A. Rizoiu, L. Xie, T. Caetano, and M. Cebrian "Evolution of Privacy Loss on Wikipedia, " in Proc. International Conference on Web Search and Data Mining (WSDM '16), 2016, , pp. 215–224. Y.-M. Kim, J. Velcin, S. Bonnevay, and M.-A. Rizoiu, "Temporal Multinomial Mixture for Instance-Oriented Evolutionary Clustering, " in Proc. European Conference on Information Retrieval (ECIR '15), 2015, pp. 593–604. M.-A. Rizoiu, "Semi-Supervised Structuring of Complex Data, " in Proc. Doctoral Consortium of the International Joint Conference on Artificial Intelligence (IJCAI '13), 2013, pp. 3239–3240. M.-A. 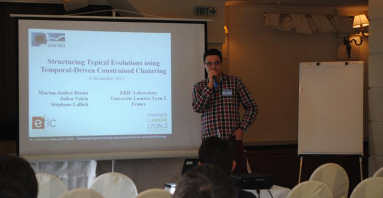 Rizoiu, J. Velcin, and S. Lallich, "Structuring typical evolutions using Temporal-Driven Constrained Clustering," in Proc. International Conference on Tools with Artificial Intelligence (ICTAI '12), 2012, pp. 610–617. C. Musat, J. Velcin, S. Trausan-Matu, and M.-A. Rizoiu, "Improving topic evaluation using conceptual knowledge," in Proc. International Joint Conference on Artificial Intelligence (IJCAI '11), 2011, pp. 1866–1871. C. Musat, J. Velcin, M.-A. Rizoiu, and S. Trausan-Matu, "Concept-based Topic Model Improvement," in Proc. International Symposium on Methodologies for Intelligent Systems (ISMIS '11), 2011, pp. 133–142. M.-A. Rizoiu, J. Velcin, and J.-H. Chauchat, "Regrouper les données textuelles et nommer les groupes à l'aide des classes recouvrantes," in Proc. Extraction et Gestion des Connaissances (EGC '10), 2010, pp. 561–572. M.-A. Rizoiu, J. Velcin, S. Bonnevay and S. Lallich, "ClusPath: A Temporal-driven Clustering to Infer Typical Evolution Paths," Data Mining and Knowledge Discovery, pp. 1–26, 2015. M.-A. Rizoiu, J. Velcin, and S. Lallich, "Semantic-enriched Visual Vocabulary Construction in a Weakly Supervised Context," Intelligent Data Analysis, vol. 19, iss. 1, pp. 161–185, 2015. M.-A. Rizoiu, J. Velcin, and S. Lallich, "How to use Temporal-Driven Constrained Clustering to detect typical evolutions," International Journal of Artificial Intelligence Tools, vol. 23, iss. 4, pp. 1460013, 2014. M.-A. Rizoiu, J. Velcin, and S. Lallich, " Unsupervised Feature Construction for Improving Data Representation and Semantics ," Journal of Intelligent Information Systems, vol. 40, iss. 3, pp. 501–527, 2013. C. Musat, M.-A. Rizoiu, and S. Trausan-Matu, "An Intra and Inter-Topic Evaluation and Cleansing Method," Romanian Journal of Human-Computer Interaction, vol. 3, iss. 2, pp. 81–96, 2010. M.-A. Rizoiu and J. Velcin, "Topic Extraction for Ontology Learning," in book: Ontology Learning and Knowledge Discovery Using the Web: Challenges and Recent Advances, pp. 38–61, 2011. M.-A. 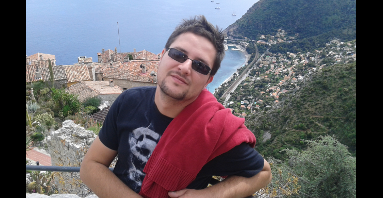 Rizoiu, "Semi-Supervised Structuring of Complex Data," PhD Thesis, University Lumière Lyon 2, June, 2013. M.-A. Rizoiu, "Textual Data Clustering and Cluster Naming," Master's Dissertation, 2009. Online social media is increasingly prevalent in shaping “offline” events, ranging from Twitter’s role in the 2016 US presidential campaign to the recent allegations that Facebook was used to convey hateful and racist messages towards the Rohingya minority in Myanmar. My research aims to tackle the grand challenge of assessing and mitigating the impact of online social media on the fundamental processes of our society. By successfully modeling and predicting the dynamics of online human attention, the benefit of my research is to understand novel societal and economic “offline” phenomena, like the spread of misinformation and the role of social bots in recent political elections, the link between the spread of hateful messages and violences towards minorities, or the emergence of disruptive business models like Uber or Airbnb. My current research interest is to model theoretically popularity on online media, as well as estimate the influence of media content and network characteristics on online attention. We established a generative model that predicts online attention, based on an exogenously-driven Hawkes self-exciting processes. We also examine the geographical diffusion of media content over time and the goal is to generate statistical descriptions of content diffusion over time and geographical areas. We are handling very large Twitter datasets (the network), which relate to Youtube videos (the content). My previous work dealt with how partial expert information can be leveraged into a non-supervised learning algorithm that treats complex data. This complex data is of different natures (text, image), it is temporal and structured, linked to knowledge repository (e.g. ontology) and/or labeled. Semi-supervised clustering is used to model the additional information (structure, labels, time) and to inject the heterogeneous information into the learning algorithm. A series of application emerge from the theoretical research: using the temporal dimension to detect temporal patters and typical evolutions, using the image labels to improve image numerical representation and an automatic topic evaluation using concept trees. Below is an interview given to Sage Research Methods in which I describe my research. The interview discusses using stochastic computational models to study the popularity of online videos, including a focus on computational social science, current research, data collection and access, identification of relevant data, how data is prepared and processed, determining the computational models to use and applying them, training or organizing the data, adjustments to the research, running the models, next for this research, and advice for others interested in this type of research. A science slam is the challenge to describe a research topic to a non-expert, with a twist of humor. At the ICWSM'17 science slam I talked about how to link exogenous stimuli and endogenous reactions to explain online popularity. Here is a short (1 page) research statement, outlining the challenges that my research tackles, and the privileged methods and tools to address them. HIPie is an interactive visualizer that enables users to reason about the virality and the popularity of online videos. It retrieves the metadata and the past popularity series of Youtube videos, it employs the Hawkes Intensity Process, our a state-of-the-art online popularity model for explaining and predicting video popularity, and it presents videos comparatively in a series of interactive plots. The ability to capture data about changing demand and supply of skills in a timely and efficient manner can provide much-needed information to inform educational and employment decisions, but we need to establish whether job advertisements accurately reflect sector-specific and geographic differences in demand for skills. This project will conduct a survey of employers which we can use to test the validity of the data and taxonomy generated from our analysis of the job advertisements. To what extent does the presence and influence of socialbots on Twitter differ across countries and issue areas? Did they infiltrate and outright manipulate the public opinion on polarized topics? This project quantifies the role and influence of automated diffusion systems in the online spread of information. Can "hate speech" be reliably measured and characterized in massive amounts of digitized news and social-media text? Can understanding and forecasting of political violence be improved by incorporating large-scale machine-generated data on hate speech in both unstable societies and established democracies? Popularity is a social phenomenon, a state of being liked or supported by many people. This project develops methods and tools for describing and predicting the popularity of online items. The study of Human Dynamics operates at the intersection of the computer and social sciences, with a primary interest in social and financial networks, crowdsourcing, urban economics, behavioral game theory, and evolutionary dynamics. Analysis of the image life cycle of politicians and companies through the online media and microblogging of the Web 2.0. Study of the evolution of the specialized discourse of the domain of nuclear medicine, taking into account	the temporal topics evolution and the different involved populations. Joint analysis of the information extracted either by data mining techniques or manually by experts in information science. Design of a novel platform for organizing and analyzing online debates. Project associated with the incubation of a start-up enterprise. 12/10/2018: The Role and Influence of Socialbots in the Democratic Process. Invited talk at the Language and Social Computing Team, Data61 CSIRO in Marsfield, Sydney. 29/06/2018: Expecting to be HIP: Hawkes Intensity Processes for modeling online popularity and virality. Invited talk at Facebook Core Research in Bay Area, California, USA. 22/06/2018: The popularity and the engagement of online videos. Invited talk at Netflix Research in Bay Area, California, USA, hosted by Sui Huang. 03/05/2018: Scalable influence estimation from online information diffusions. Invited talk at the Max Planck Institute for Software Systems in Kaiserslautern, Germany, hosted by Manuel Gomez Rodriguez. 16/03/2016: Evolution of Privacy Loss in Wikipedia. Invited speaker for the March session of the Monthly Wikimedia Research Showcase. 15/06/2015: Challenges of the social media: Information diffusion in social networks. Invited speaker with Romanian Scientific Diaspora Symposium. 13/03/2014: Le contexte sémantique et la dimension temporelle dans l’analyse de données complexes. Invited speaker with Laboratoire d'Informatique d'Avignon. 02/10/2013: CommentWatcher: plateforme Web open-source pour analyser les discussions sur des forums en ligne. Invited speaker with BLEND 2013 conference. 26/08/2013: Extracting and evaluating topics. CommentWatcher, an online forum analysis tool. Invited speaker in the Chronological Text Mining session of the Research reunion of the 59th ISI World Statistical Congress. 12/02/2013: Advancements in temporal clustering. Research reunion of the DMD Team . 21/01/2013: Using a Pareto Front for a Non-Supervised Feature Construction Algorithm. Thematic day of the DMD Team : Using Multi-criteria Optimization. This course is for the third year of undergraduates in the Research School of Computer Science. It presents relational theory and conceptual modelling; privacy and security; statistical databases; distributed databases; data warehousing; data cleaning and integration; and data mining concepts and techniques. I give lectures concerning databases and data warehousing and data cleaning and integration. This course is for the third year of undergraduates in the Research School of Computer Science, as well as Honnors students. It presents techniques related to processing online document, such as (A) information retrieval, (B) natural language processing, (C) machine learning for documents, and (D) relevant tools for the Web. I give lectures concerning the machine learning part and the social media and sentiment analysis part. This course is for the second year in the Excellence European Master DMKM. It presents advanced machine learning techniques. Together with S. Lallich , we present association rules mining and class rules mining, ensemble methods (bagging, boosting) and statistical testing procedures (cross-validation, student t-test, etc.). I give practical lectures for this course. I am a Lecturer in Computer Science with the Faculty of Engineering and IT in the University of Technology Sydney. Between March 2016 and January 2019, I was a Research Fellow, then Lecturer with the College of Engineering and Computer Science at the Australian National University in Canberra. I was equally affiliated with the Data61 unit of CSIRO, in the Decision Sciences team. Between May 2014 and February 2016,I was a researcher within the National ICT Australia in Canberra Australia, working in the Optimization Research Group. I was equally an adjunct lecturer with the College of Engineering and Computer Science at the Australian National University in Canberra. Between September 2013 and May 2014, I was a PostDoctoral researcher with the ERIC Laboratory, financed by the ImagiWeb Research Project. I was equally an assistant professor with the DIS Department, at the University Lumière in Lyon. Between 2009 and 2013, I was a PhD student at the ERIC Laboratory with the University Lumière Lyon2, under the supervision of Stéphane Lallich and Julien Velcin. I defended my PhD thesis on June 24th 2013, with honors "Très Honorable". In July 2009, I obtained my MSc (graduating first of promotion, with honors.) in Data Mining and Knowledge Management from the Polytechnic School of the University of Nantes, France and wrote my Master’s Thesis on "Textual Data Clustering and Cluster Naming" after an internship at the ERIC Laboratory. 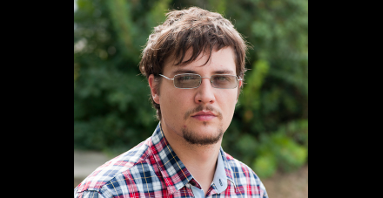 Between 2004 and 2009, I did my undergrad and obtained in September 2009 my Engineer Diploma (double diploma, in parallel with the French Master's) in System and Computer Engineering from the Faculty of Automatic Control and Computers of the Polytechnic University Bucharest, Romania. 2018-09: We've got the attention of the media! Both the Business Insider and the ANU Reporter wrote about our findings concerning the bot influence in the 2016 US Elections. 2018-06: Just returned from ICWSM 2018 in Palo Alto, California, where our team presented three papers. I also visited and gave invited talks at Netflix Research and Facebook Core Research. See more details here. 2018-05: After the WWW 2018 conference in Lyon, France, I have visited for a week the Max Planck Institute for Software Systems in Kaiserslautern, Germany, hosted by the team of Manuel Gomez Rodriguez, one of the top groups world-wide in stochastic modeling. 2018-03: Three of our papers just got accepted at ICWSM 2018, the top computational social science conference. Rendez-vous in Stanford, California, US. 2018-01: Our slick-looking HIPie popularity explorer tool will be showcased at the WWW 2018 conference in Lyon, France. Check out it's video tutorial, Github repository and live installation. 2017-12: Our paper "SIR-Hawkes: on the Relationship Between Epidemic Models and Hawkes Point Processes" has just been accepted at the WWW 2018 conference in Lyon, France! 2016-05-03: Check out our brand new Computational Media lab page. 2016-03-16: Our work got the attention of Wikimedia Research! I presented "Evolution of Privacy Loss on Wikipedia" in the March session of the Monthly Wikimedia Research Showcase. See recording here. 2015-10: Our paper "Evolution of Privacy Loss on Wikipedia" has just been accepted at the WSDM 2016 conference in San Francisco! This year 2015, I give lectures about Machine Learning and Social Media and Sentiment Analysis in the context of the Document Analysis course, with the Research School of Computer Science at the ANU. Since May 2014, I am at the NICTA lab, Canberra, Australia, as a researcher, working with Manuel Cebrian, Lexing Xie and Pascal Van Hentenryck. Starting from May 2014, I will be at the NICTA lab, Canberra, Australia, in a research visit and I will be working with Manuel Cebrian and Pascal Van Hentenryck. On the 24th of June, I defended my PhD thesis, entitled "Semi-Supervised Structuring of Complex Data", and I obtained the title of PhD from the University Lumière Lyon 2. The thesis manuscript is available here. In July, I will be at the NICTA lab, Australia, in a research visit and I will be working with Tiberio Caetano. In August, I will participate at the Doctoral Consortium of the International Joint Conference on Artificial Intelligence. My submission entitled "Semi-Supervised Structuring of Complex Data", has been accepted for publication in the Proceedings of IJCAI'13. The paper "Unsupervised Feature Construction for Improving Data Representation and Semantics", written with J. Velcin and S. Lallich , has been accepted for publication in JIIS. I was part of the organizational committee and head of the volunteers team for the joint organization of the conferences ALT'12 and DS'12. I gave a lecture on Using a Pareto Front for a Non-Supervised Feature Construction Algorithm . You can find more details about my experience, research and education by downloading my (short) CV. Here is my Research statement -- detailing my research vision -- and my Teaching statement -- detailing my current and past teaching and supervision experience. Copyright 2018 Marian-Andrei Rizoiu. Get this theme at Styleshout.